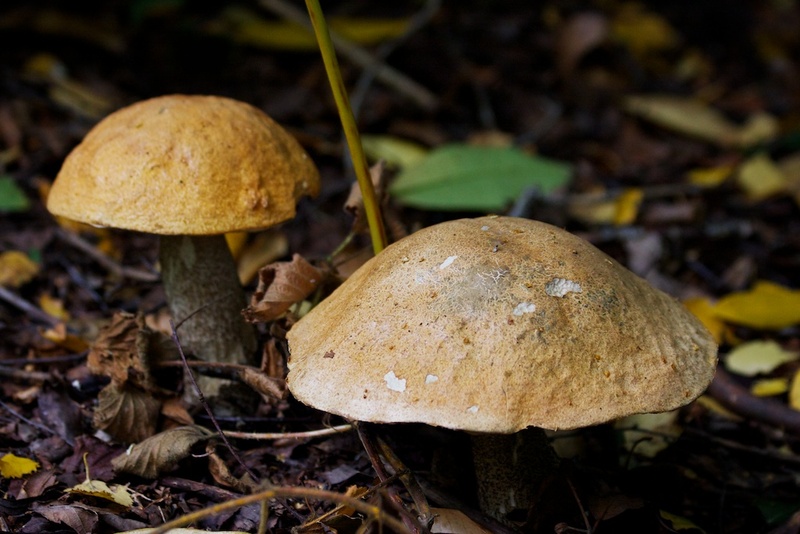 As I mentioned in my last blog I took a couple of photos of mushrooms and a few others that I was going to post later. On Saturday we went to Clumber Park, near Worksop and I took a few more mushroom photos so I thought I'd bundle all fungii shots together in a separate post. 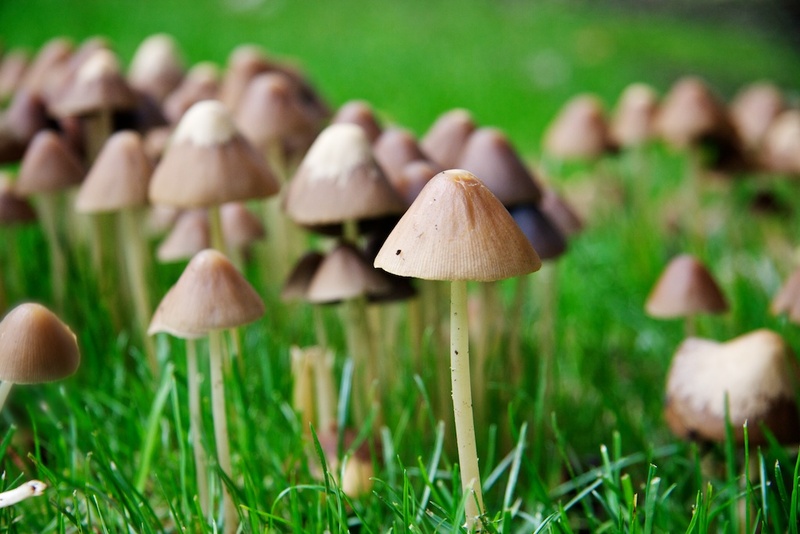 One of the things to mention straight away is that mushrooms tend to grow in gloomy places so it's usually a challenge to get any light on them without using a flash, which I didn't have with me either day. The first photo is of a very tatty looking mushroom which I took with my 17-85 lens at 85mm and even with the ISO at 800 and I could only get 1/15th of a second. Much too slow for this focal length but the image stabilisation did a pretty good job. This next shot was using the same lens and focal setting but it was a bit more in the open so I lowered the ISO to 640 and managed to get 1/90th of a second this time. The challenge for this one was that my camera was down on the floor so I couldn't look through the view finder and I also had to rely on the autofocus doing it's job. I guess I could have laid down on the wet grass but as I wasn't in the best of health I decided that was probably not a good idea. So on to Clumber Park and in this next photo the mushroom was in a patch of sunshine which had managed to find it's way through the trees. Unfortunately the mushroom was a bit covered over with grass and brambles so I tried to pull as much stuff out of the way but I was concerned that the sunshine could disappear at any moment so I took a quick shot. This time I was using my 70-300 lens at 105mm and managed to get 1/90th of a second at ISO 100. The main problem with this lens is that the nearest focussing distance is about a meter (3 ft) so I had to backup a way to get the composition I wanted. This next photo was back into the dark again so I turned the ISO back up to 800 so I could get this shot at 1/180th of a second. 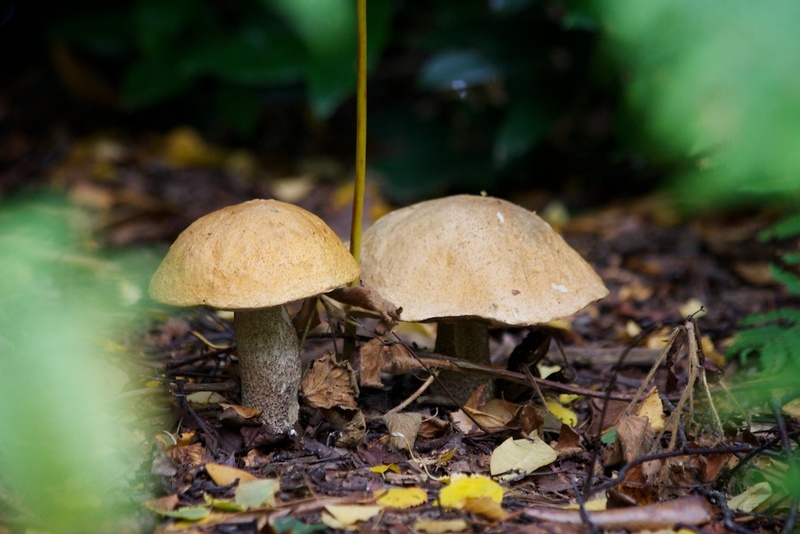 I moved around a bit to get this alternative shot of the two mushrooms and this time I was looking through a gap in the undergrowth hence the green blurry areas at each side. I think maybe when I look at it now that maybe I should crop out some of the green because it's too distracting. However I think I prefer this angle to the previous one because the stalks of the mushrooms are more visible. 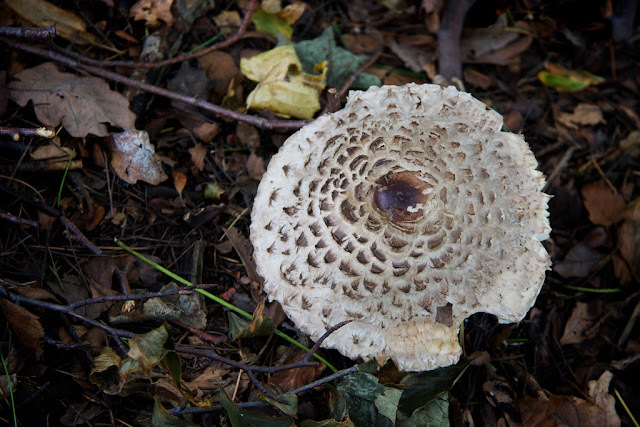 The final photo was the least blurred of a set of half a dozen shots that I took of this mushroom. It was in a very dark spot underneath a load of brambles so I couldn't get very close to it at all. As a result I had the lens on full telephoto at 300mm and tried to take shots at 1/20th of a second which is sheer madness even with the image stabilisation on this lens. 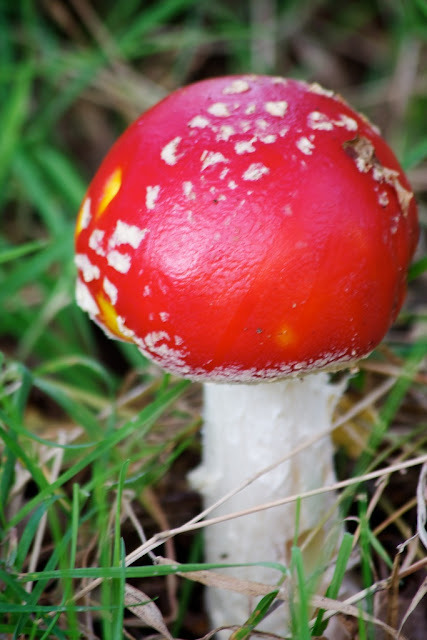 To be honest the mushroom wasn't that good so I didn't bother spending the time trying to get a better shot. It shouldn't really be in this post but I thought it wouldn't be too bad. So next time I'll post the other photos from Beaumont Park and maybe some from Clumber Park too. So it seems, referring back to my previous post, that I wasn't just suffering from post-holiday blues and I've had a week off work with viral pleurisy. It's where the lining between the lungs and the chest wall (pleura) get inflamed and it is extremely painful to breathe. Anyway I'm back at work and although not completely at full health I am well on the mend. On the day before I went back to work I decided to venture out for a walk to see how I managed to get about and I was OK but took it very steady. 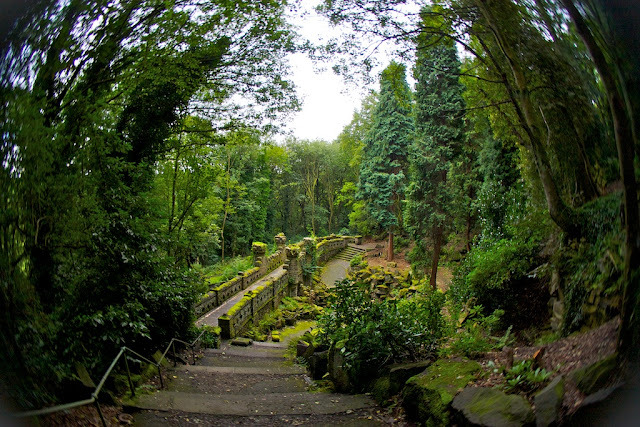 Anyone who may have been to Beaumont Park (or read my post from the 6th June last year) will know it's perched on a steep hillside with many sloping paths and steps, perhaps not the best place to go when it's hard to breathe. 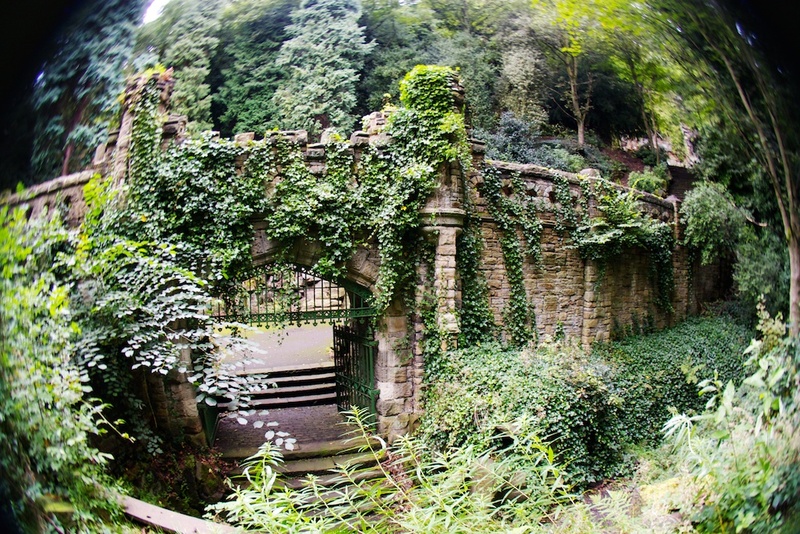 The original main entrance was at the bottom of the park and the visitors used to arrive on the railway and enter the park through the beautiful gates under the bridge. It guess it was more like entering the grounds of a castle than a park and I would think that it would have been very busy at the weekends in the summer from the early 19th Century until after the Second World War. I imagine that people would have been dressed in their best Sunday clothes to promenade around the many paths, past the water cascade and up to the bandstand at the top of the park. 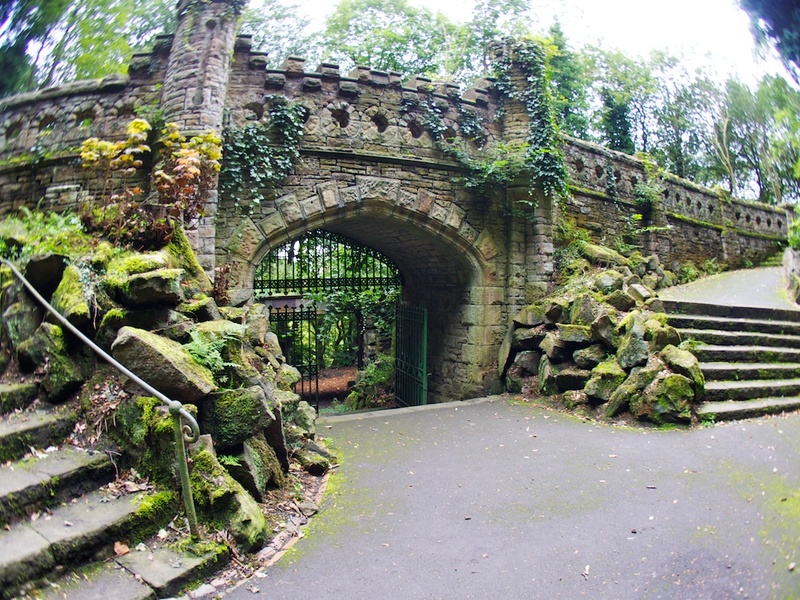 The railway line has long since been abandoned and the main entrance is now at the top end of the park. The bridge over the entrance has been closed for a while with red and white tape preventing access and spoiling the view somewhat. I was so pleased when I walked down the steps towards the old entrance to see that it has been re-opened and the tape has gone. 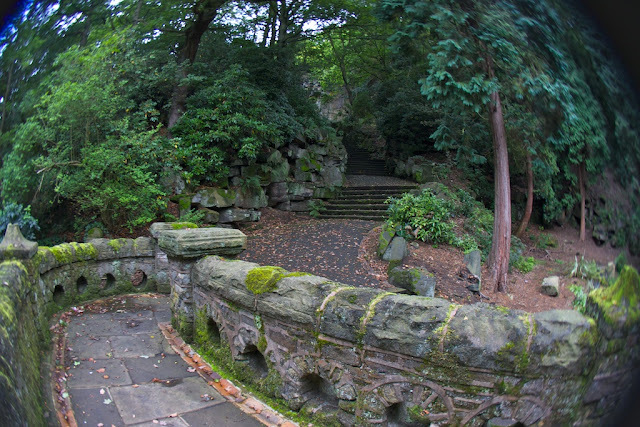 This first photo is as I approached the entrance using my fisheye lens attachment on my Lensbaby Composer. 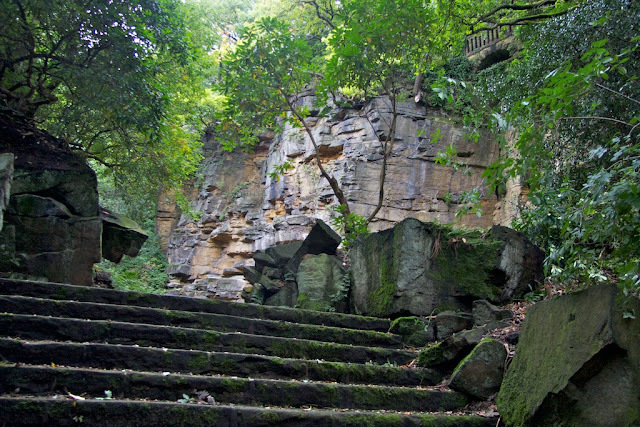 Everything is a bit overgrown down here so it feels a bit like descending into a abandoned fort down a canyon within a tropical rainforest. 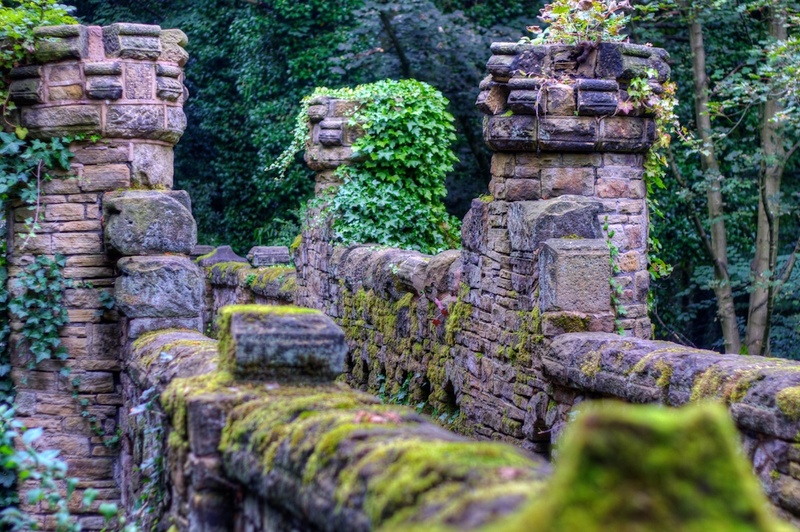 On the bridge the old stonework is overgrown with moss and ivy and some of the bits of stone look as if they've been dropped here from somewhere else. This next photo was three shots taken with a 50mm lens at different exposures and tonemapped to bring out the rich detail in the stonework. At the other end of the bridge there are step up to where the original cascade used to flow under a little bridge down a fifty foot cliff face and into a deep pool. In the centre background of this photo you might be able to make out apart of the cliff face. This photo and the next two were also taken using the fisheye because I wanted to get the very wide angle shots and I quite like the distortion around the edges. This next shot is looking out through the main entrance under the bridge. 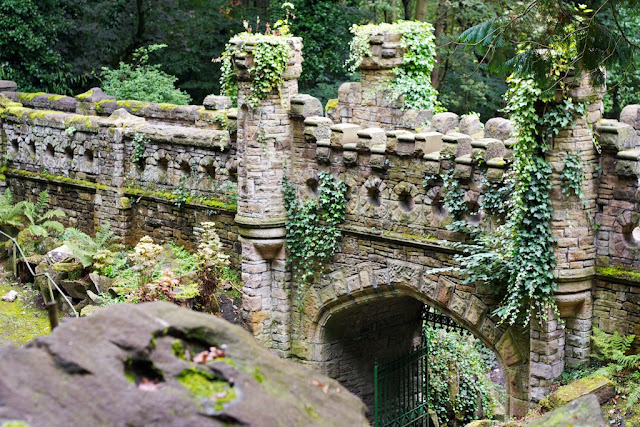 The stonework here is very impressive and I would think that without the moss and ivy could look even better. I had one gate open and one shut for this shot. I experimented with them both open and both shut but in the end I preferred this shot (mainly because it was in focus, the Lensbaby has to be focused manually and with my eyes it can be a bit hit and miss whether anything is in focus). Through the gate you might be able to make out the iron girder which is where the railway line goes over the path into the park. It's all very overgrown out there now so I'm not sure whether there was another path from the old railway station which is a couple of hundred yards down the track. This shot was taken from the old railway bridge and looking into the entrance. From here you can get a better idea of how overgrown it is with the ivy and bits of trees everywhere. I imagine that in its heyday this area would all have been kept very trimmed and clear of ivy. I'm not sure whether it shows up on this photo but the stones on which the gates are hung have been replaced with nice newly carved stones. The workmanship is good and matches the original stonework very well apart from being clean. I guess it won't take long for them to weather and merge into the old stonework better. Behind me there are more trees towering above the old railway line and it is quite dark down here even on the brightest days. I had probably spent a good half to three quarters of an hour down here taking photos and opening and closing the gates so I think I had exhausted the subject for today. Next time I come here I might take some closer up shots to capture more of the detail in the stonework. I took this final shot of the entrance as I started up the path towards the site of the old cascade. I included the old bit of stone in the foreground to add a bit of depth to the shot. I wasn't going to include this last shot in the post but as I've mentioned the old cascade a couple of times I decided to add this one. In the foreground are the steps coming up from the old entrance and in the top right corner you can see the little bridge where the water for the cascade used to come down. I imagine that when the cascade was in full flow this would have been quite a spectacle. The pool no longer exists and has been filled in for safety I would think. A new cascade has been made near the top of the park with a pond and a fountain (see my post 06/07/09) but I don't think it's as impressive as this old one would have been. However I shouldn't complain as they making improvements to the park every time I come back to see it. I don't suppose it will ever be as popular as it used to be but I quite like the old abandoned areas as much as the newly refurbished ones because there are so may photo opportunities here. 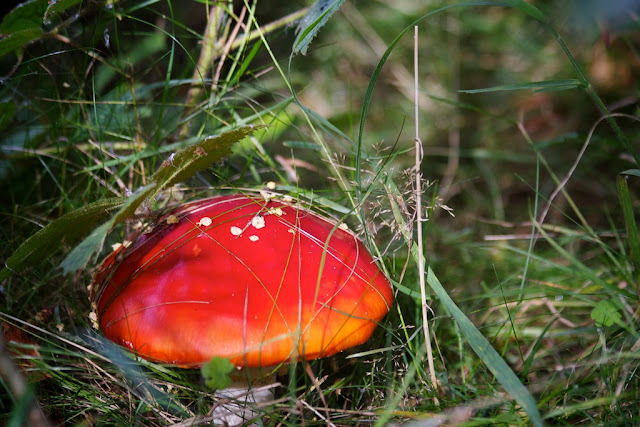 I have a few more photos from the day (fungi, flowers and butterflies) and I might post them later. We've been back from France for over a week so I thought it was time to start posting some stuff from the holidays. To be honest we've not been feeling too bright since we came back and I don't know whether it's just post-holiday blues or maybe we've got some sort of flu like bug. Anyway less of the excuses. I've decided to randomise my posting because day by day over three weeks seems a bit of an ordeal, plus I've not made that much progress on going through the nearly 1300 photos and 50 video clips since we got back. I'm starting with the ethnic dancers at Lire because these a straight video clips that all I've had to do with them is upload them to YouTube. I made mention of these dancers on the 1st September in my post about Chateau Brissac being closed but didn't have any photo to include of the dancers. They did about 10 or a dozen dances which were all brilliant and I videoed these three clips, hope you like them. We left the gite and visited a few places on the way to Villaines la Juhel which were recommended by the eyewitness guide to the Loire. We weren't too impressed, the first was a small town that nothing out of the ordinary, then there was a big monastery which would have been OK if they actually allowed access to more than the church. Although the church itself did have some amazing carvings but as usual I couldn't take photos, had to buy a couple of postcards. The next place to visit we didn't even get out of the car so we just carried onto the hotel. It was very hot again on the way so we had to shower as soon as we got to the hotel. There was a pizzeria on site so we decided to go there instead of venturing out again in the car. The food was very good, we had a lot of wine and when we left the barman insisted that we join him in a shot of calvados for his birthday. Today we moved onto Poix near Amiens. As usual we took an unexpected detour around Rouen, I think we get lost every time we get anywhere near the place. Finally arrived and the hotel is quite nice, there is a bar and restaurant in the hotel so we may well eat here tonight. We went for a walk around the town and there's nothing much to see although we did visit the local ancient church. In the attached cemetery we were surprised to find a plot of World War Two war graves of commonwealth airmen. There were almost one hundred graves and there was a big plaque explaining all about why they were there. Many of the airmen were Canadian, Australian and from New Zealand but most were from the UK. The photo attached was taken in early July this year and looks exactly as it did today. Apparently there is a three day festival of hot air balloons going on here and some of the balloonists are in the hotel. We've found some information on the interweb that there are eleven balloons which is far less than the hundred and fifty plus that we saw last year at the chateau at Brissac. Lynne just picked up a brochure in the bar with the itinerary and tonight is the inauguration so we'll give that a miss. Tomorrow they're doing a competition during the day and then in the evening they are at the nearby racecourse when they are doing a blowing up the balloons and there is a concert by 'Un Notre Parfum' from Rouen followed by fireworks. We might go to that although it depends when we get back from Amiens. There is another competition Sunday morning and something else in the evening but we will be heading back to Calais so will miss it. On Sunday we went to the Comme Dans l'Temps (as in time) country fayre at Lire, just south of the Loire from Ancenis. As promised there was music, dancing, country crafts, jalopies, old farm machinery, food, drink and surprises. We arrived during the lunch break so we had sausage sandwich, crepes with sugar and a glass of cider. After lunch, on the stage we had a brass band doing some French favourites and 'Roll out the barrel', then some dancers in Victorian type dresses followed by some ethnic dancers from either eastern Europe or maybe Greece or Turkey. Around the farm and fields there were all types of crafts being demonstrated including clog making, horse shoeing, bread making, wood working with old fashioned tools and a laundry in a pretend river using wooden boards and bats. There was an area with old mainly French cars and another area with old tractors and other farm machinery. There were stalls for the Poste, brick making, a pretend school, lace making, tombola, raffle, bowling and interestingly Esperanto. We had an M.C. In full top hat and tails with a radio mike wandering around and commenting on everything that was going on. Free parking and free entry made it a great afternoon out for a Yorkshireman. After a few hours we'd seen it all, had another drink and went home to sit by the pool. The next day we chilled out around the gite and I went out for a couple of hours on my own to take some photos. On Tuesday we decided to got to the chateau at Brissac-Quince where we had been to the hot air balloon festival last year. We took a scenic route on the south side of the Loire and arrived around lunchtime. Went to a pizzeria where the waitress earned herself no tip by ignoring us as much as she could and serving everyone else before us. Fortunately the food was good otherwise I'd have given them 1 cent tip as a protest. After lunch we wandered down to the chateau where there was a sign that it would re-open at 2pm so we sat and waited a while. When there was no sign of life after 2 we had another look at the sign and noticed a small addition which said 'Ferme a Mardi', so I guess it doesn't open on a Tuesday, great. So we took a different scenic route back and chilled out by the pool again. Today is our last day at the gite so we've been getting stuff packed ready to throw into the car in the morning and head towards the next hotel at Villianes de Juhel. We've picked a few stops on the way there as it's only a couple of hours from here and we can't book in until after 5 pm. It's quite hot again today but very windy as usual which keeps it quite cool unless you're out of the wind.